As can be seen from the recording dates, and as Jacob Heringman mentions in his booklet notes, this disc is a compilation from five CDs recorded in the late 1990s. He says: "all five original CDs � will soon no longer be commercially available (although a limited number can be ordered directly from heringman@lycos.co.uk) so another function of this compilation is to preserve the best material from them as I move on into new projects" Earlier he explains that he tried to choose his best performances. He had identified what he felt was the best music and also a wide variety of styles and techniques from various European countries. He certainly achieves his ends and creates a beautiful and memorable listening experience whether you are interested in early music or not. This is both a relaxing and a stimulating disc and generous in its length. Three of the typical renaissance styles are found here. The free �Fantasias� in which the composers indulge flights of imagination and fantasy. Examples include the famous and oft-recorded �Fantasia que contrahaze la harpa en le manera de Luduvico� - a piece in honour of a man who must have had a remarkable and rather modern sense of harmony judging from the work of Alonso Mudarra (1510-1580). There are also Fantasias by Luis Milan, (c.1500-1561) which are simply music without an influence, often sectionalised and with many diverse contrasts. Then we have the intabulations of motets, which gave the player a chance to move into the more rarefied repertoire of the church. These may be straight transcriptions without many embellishments as in Josquin�s �Ave Maria� or they may be very ornate indeed, as in Bakfark�s arrangement of Josquin�s �Non accedat� which runs to well over six minutes. This is quite the longest track on the CD and one which needs concentrated listening. As a contrast there are several dances. The dance is, of course, the form most associated with the instrument. The example by Anthony Holborne (d.1601) is from his collection of 1598. The name of Matthaus Waissel (c.1540-1602) was new to me. He was a Polish schoolmaster whose lute music publications were very popular. His Polish Dances are varied in speed, tonality and rhythm and are never dull. There is also a transcription of two secular songs by Josquin (c.1440-1521) and one each by Crecquillon - an important composer from the Low Countries in Josquin�s time - and the heavenly Jacques Arcadelt (1505-1568) a man associated with the early Italian madrigal. Biographies, as far as they can ascertained are in the booklet and as many of the composers are very little known this is most welcome. Valentin Bakfark (c.1526-1576) is a particularly interesting figure and apparently considered the greatest lute player of his day. 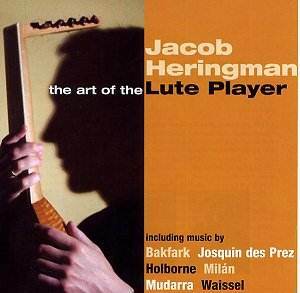 Jacob Heringman is a consummate artist and a very experienced early music performer. He is not only an exquisite soloist but has a perfect track record as an accompanist with many early music groups. I�m only sorry that he plays a wonderful wire-strung cittern or bandora on only one track (a �Horne pype� by Holborne) as this is not only delightful to hear but adds variety to the disc. Although recorded at different times and at differing venues the recordings are at a consistent level and sound as if they were made in a consistent acoustic. There is no need to keep adjusting the amplifier volume for each new track as happens on some compilations. All in all this disc offers a delightful and relaxing experience and I would strongly recommend it.